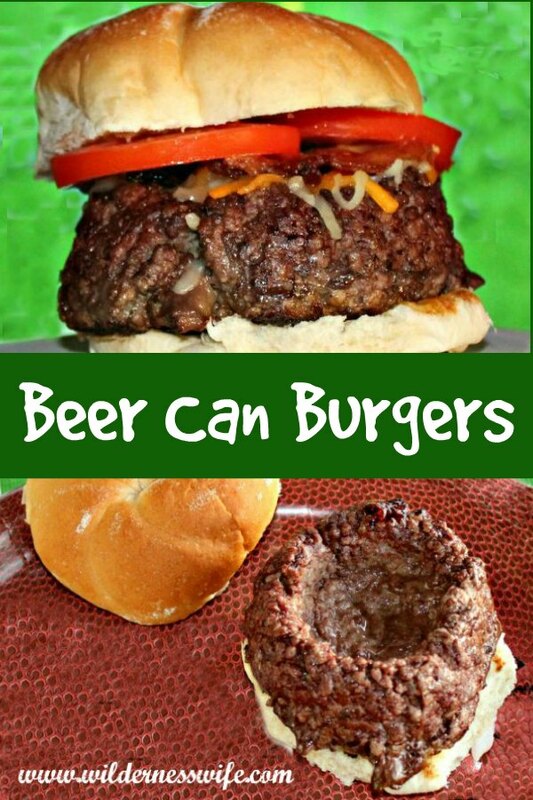 Beer Can Burgers – A hamburger you can stuff! Summer is hamburger time! Hamburgers and hot dogs are the mainstay at any backyard cookout. 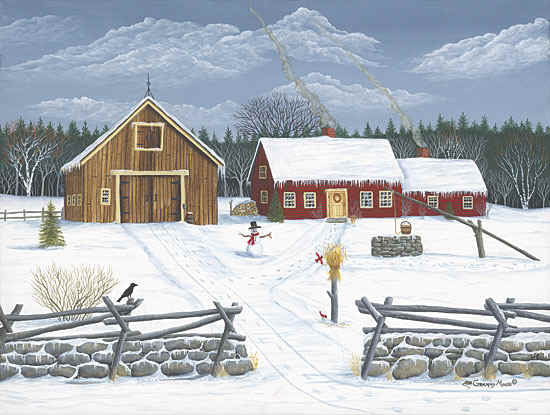 Fire up the barbecue grill and throw on the dogs and the patties. 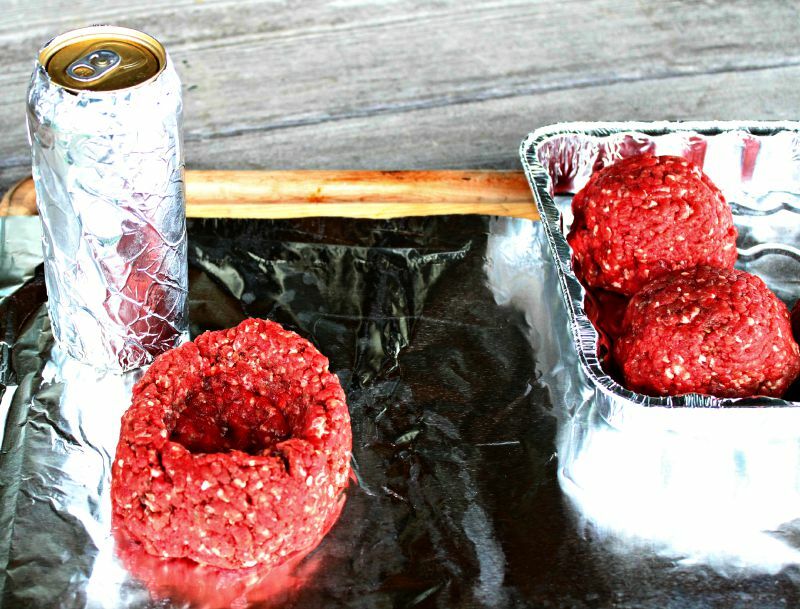 Want to make your hamburgers different and far more interesting – make some Beer Can Burgers. They are shaped with a deep depression in the center so that you can add all kinds of condiments and toppings. The possibilities for filling them up are endless. We set up a “Burger Bar” so everyone can have the fun of dressing up their burger with numerous toppings. The “Beer Can Burgers” are fun to make and everyone can “personalize” their burger by stuffing them with their favorite fillings. You can lay out a “burger bar” with all sorts of fixings like caramelized onions, roasted garlic, roasted green peppers, salsa, sliced tomatoes, pesto, pickles, relish, a variety of shredded and crumbled cheeses (Blue Cheese is my personal favorite) , and assorted condiments. Then you just grab a bun and start building your burger. The only ingredient for Beer Can Burgers is ground beef, also known as hamburg or hamburger. Ground beef comes in different “categories”. Any cut of beef can be ground up to make ground beef, but the most popular choice is chuck steak which has a rich flavor and decent fat to meat ratio. Often round steak is also used and makes a decent hamburg. Hamburg/ground beef is usually categorized by the percentage of fat. I use Chuck because the higher fat content (78-84% lean) adds a lot of flavor. From a dietary standpoint, I don’t worry too much as the fat drains off in the cooking on the barbecue grill. I use about 1/3 lb. of hamburg for each burger. First I shape the hamburg into a round ball, mixing in a little salt and pepper as I do it. I get them prepared ahead of time and pack them in a foil pan. Chill them in the fridge till I’m ready to start cooking them. 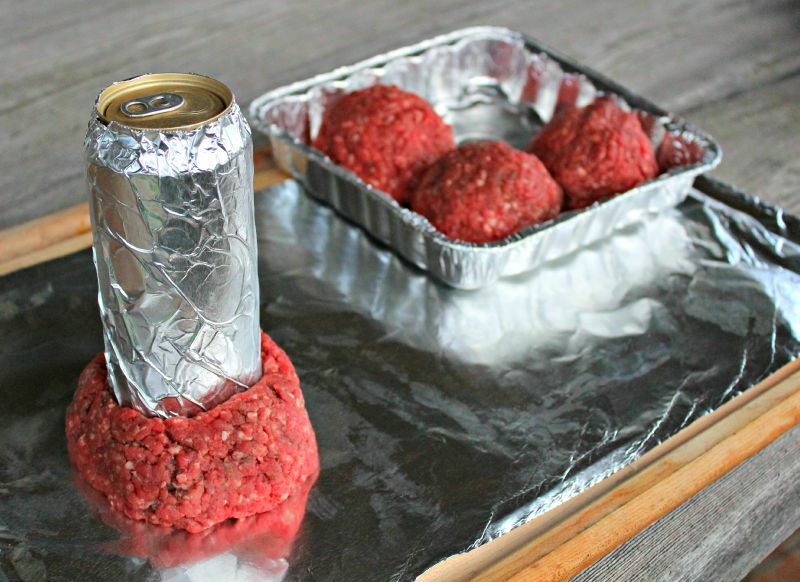 When I am ready to cook the burgers, I wrap foil tightly around a beer can and place it on top of a burger ball. Then I firmly push down to make a “well” in the center of the burger. I shape the meat around the can so that it is evenly distributed. Gently remove the can and it leaves a depression that can be filled with all kinds of good stuff when the burger is done cooking. The burgers are cooked using the indirect heat method. If you are using a gas grill, be sure to preheat the grill using all the burners. Then turn off all the burners except one, set that lit burner on high. 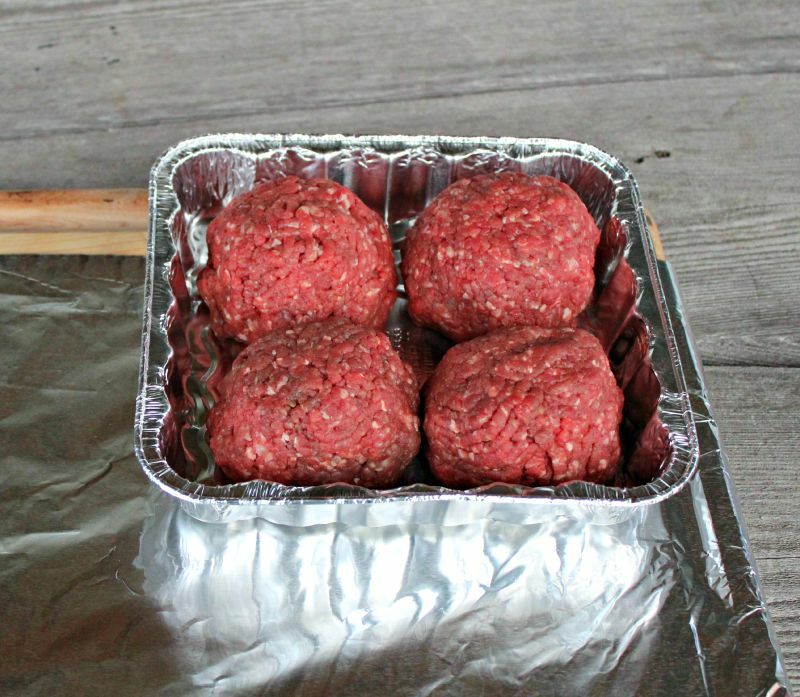 Place the burgers on the opposite side of the grill from the coals or lit burner and close the lid. The burgers will cook slowly and evenly for about 15-25 minutes. Check after 15 minutes. When done, carefully slide a spatula under the burger and holding with a fork in the other hand, tip it on its side to drain any fat from the “well”. Place it on a bun and fill it with the stuffings of your choice. I did mine with caramelized onions, roasted garlic, crumbled bacon, crumbled blue cheese, mayo, and tomato. We’re talking Hamburger Heaven here. It was absolutely delicious. 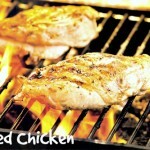 Best Grilled Chicken Marinade – Grillin’ can be thrillin’ and easy! They are fun and everybody loves building their own burger from the “Burger Bar” we set up with all sorts of toppings and condiments. Now that is an American styled burger! This is perfect for a backyard BBQ. That’s one crazy burger there. I am curious about how well the well cooks in the burger. But I’m guessing as you kept the lid closed the whole time it should be good. I will have to try this sometime. Exactly. The burner under the burger is turned off so that burger cooks indirectly from the heat of the other burners. Wow, this looks delicious! I’m so going to bake that! My brothers are going to love this! Gosh, I’ve seen chicken beer but this is the first. LOL… Actually must give it a go as well… thx. They’re a lot of fun. Allows for a lot of creativity when “building” the sandwich. this is such a cool idea, i like the idea of being able to stuff your burger. at first i thought of beer can chicken and then when i read the post realized it was something different but equally cool, great to try now that it is warm outside. oh my goodness! this looks so good. i love stuffed burgers. i must make these tonight! That looks fun! 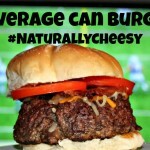 Not a burger person but Will surely share this idea to friends! What a super way to cook burgers on the grill! I’d love to get one of those outdoor grills one day and try this. A grill is a great investment for summer. Keeps the kitchen from heating up and its a great center for entertaining. When you get one you’ll really enjoy it. I don’t eat beef! But, this looks so thoughtful. We all have our preferences and I respect a person’s choice in matters like these. I, however, could never give up eating beef! Just the cowgirl in me I guess! Be wsafe and well! 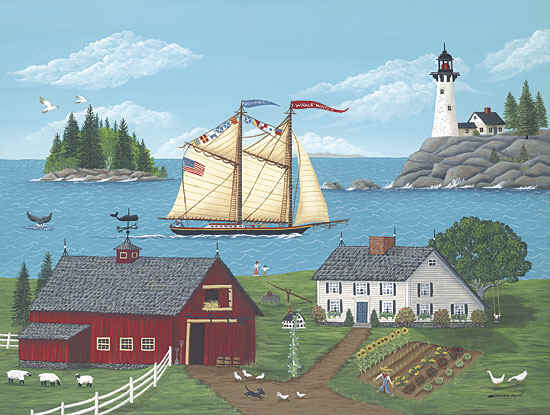 Its summer here in northern Maine USA although this year it seems like it was never going to show up. We’re right in the height of barbecue. 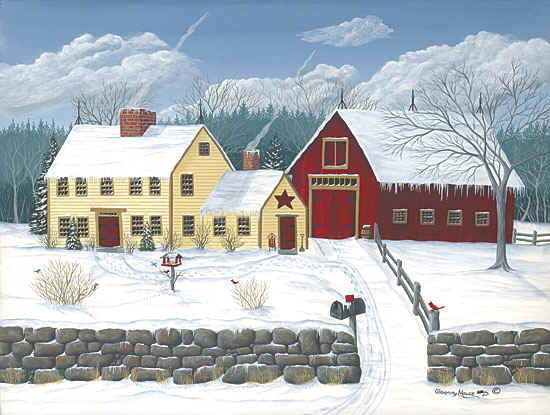 cookout season and it is such a welcome relief from all the snow we had this past winter. What a fun burger idea! I am so going to have to try this out next time we have a cookout! What a fun idea and an easy way to keep the condiments from falling out of the burger. Definitely something I will try at my next BBQ! Oh wow! This is an interesting way to make burgers and sounds really creative and smart. Awesome! Oh yum, this looks like a fabulous meal! We make burgers a lot during the summer, so I’ll have to try these! The variety of toppings you can put on them are fun and they hold it altogether well. Salsa is also a great thing to stuff them with. There all kinds of possibilities. Wowww this looks yum! 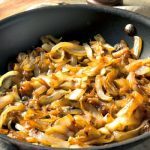 I would love to try this recipe at home! It’s easy and fun. Making a “burger bar” of toppings and condiments is great fun at a cookout. That’s what I love about them. You can load them up with all kinds of goodies.